This shader will simulate reflective surfaces such as cars, metal objects etc. 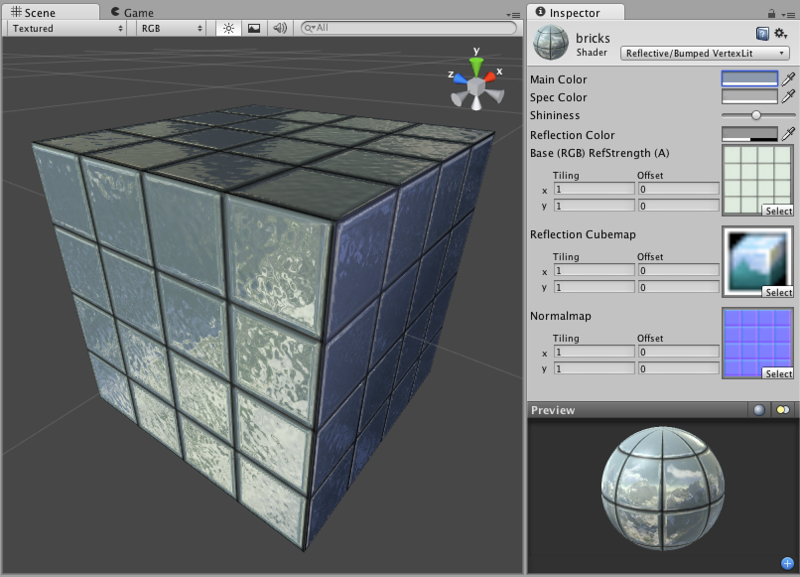 It requires an environment Cubemap which will define what exactly is reflected. The main texture’s alpha channel defines the strength of reflection on the object’s surface. Any scene lights will add illumination on top of what is reflected. This shader is Vertex-Lit, which is one of the simplest shaders. All lights shining on it are rendered in a single pass and calculated at vertices only. Because it is vertex-lit, it won’t display any pixel-based rendering effects, such as light cookies, normal mapping, or shadows. This shader is also much more sensitive to tesselation of the models. If you put a point light very close to a cube using this shader, the light will only be calculated at the corners. Pixel-lit shaders are much more effective at creating a nice round highlight, independent of tesselation. If that’s an effect you want, you may consider using a pixel-lit shader or increase tesselation of the objects instead. This shader is a good alternative to Reflective Normal mapped. If you do not need the object itself to be affected by pixel lights, but do want the reflection to be affected by a normal map, this shader is for you. This shader is vertex-lit, so it is rendered more quickly than its Reflective Normal mapped counterpart. Generally, this shader is not expensive to render. For more details, please view the Shader Peformance page.